Fountain House Gallery Rocks "Mad About Art"
Fountain House Gallery's recent Mad About Art was an event for the record books. This annual art auction and benefit is a perennially glittering celebration that raises funds to support the extraordinary work of Fountain House Gallery, the premier venue in New York City representing artists living with mental illness. This year's event, held at the venue Metropolitan West, was an unqualified triumph - artistically and financially. 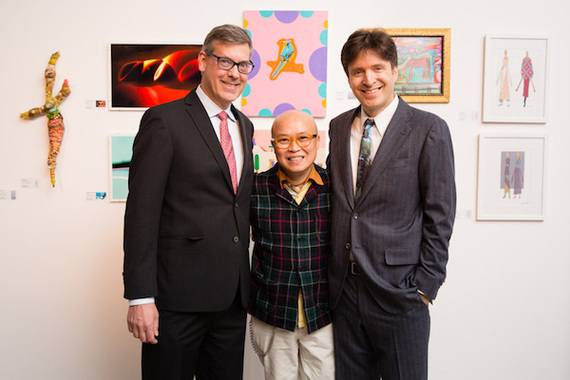 and Phong Bui, as well as Frank Maresca of Ricco/Maresca Gallery. 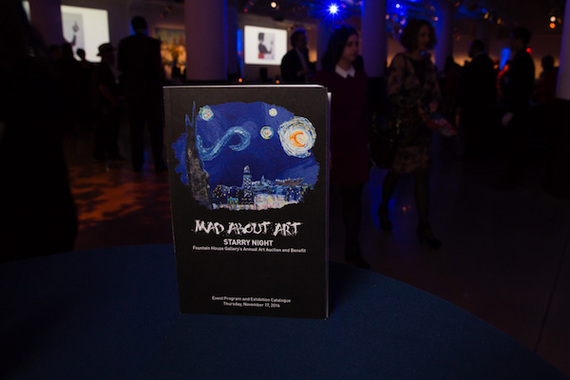 The theme of the evening was "Starry Night," a tip of the hat to the iconic Vincent van Gogh masterpiece The Starry Night, which is a fixture of the permanent collection of the Museum of Modern Art. Among the varied works made for the art auction were a number of interpretations of the Van Gogh original, as seen through the eyes of the artists of Fountain House Gallery. All Gallery artists are members of Fountain House, the leading community-based center for mental health recovery and the model for more than 300 programs throughout the United States and around the world. 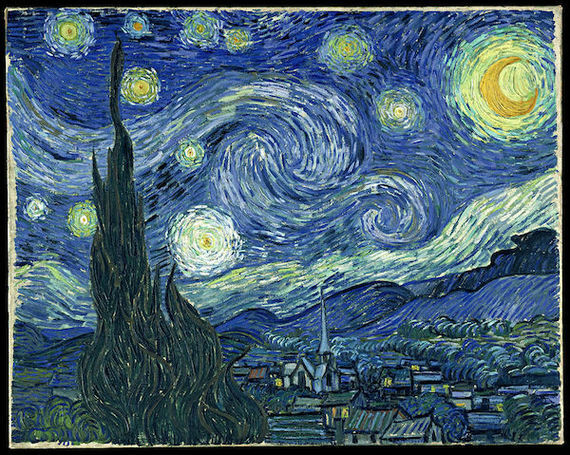 Van Gogh's "The Starry Night" inspired the event theme. Image public domain via Wikimedia Commons. One noteworthy Fountain House member (and prolific Gallery artist) is Jonathan Glass, who took to the podium to address the assembled guests. He spoke movingly of the transformative influence of Fountain House and the Gallery on his way of living, particularly in "providing the structure that has made me a better artist." Jon wove into his personal account elements of Van Gogh's life and art, referencing not only the visionary Post-Impressionist's genius but also his struggle with mental illness. Jon's artwork is striking. His specialty is pen-and-ink drawings of musicians (primarily jazz players) in live performance. He frequently exhibits at music venues around town and was profiled last year in The New York Times. Images of Jon's work were recently incorporated into fashion designs by the Alexandra Reboul Collection, including a limited edition "Gypsy Jazz" scarf created expressly for the Mad About Art event. 400 attendees turned out to support Fountain House Gallery. Ariel Willmott, Director of Fountain House Gallery, shared some splendid news with the gathering: The artists' long-held dream of having a studio in which to create and collaborate has become a reality. The ink is dry on the lease for a commodious Long Island City space, soon to be abuzz with artistic activity. 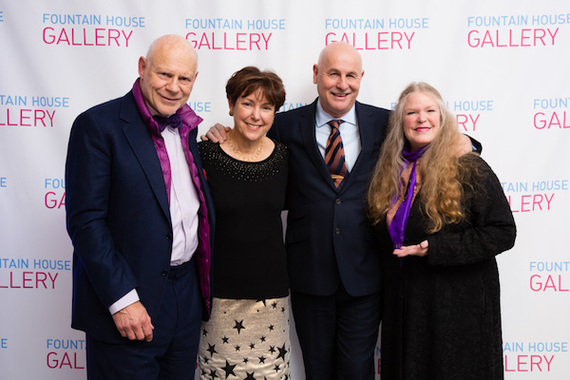 Among the Event Chairs were Francis Greenburger and Carmel Fromson, here with Fountain House President Kenn Dudek and Rebecca Hoffberger, Founding Director of the American Visionary Art Museum and member of Fountain House Gallery's Art Advisory Council. Photo: Leslie Barbaro Photography/Fountain House. As the electronic auction bidding hummed along, I was delighted to renew acquaintance with Francis Greenburger, sporting one of his signature bow ties. I first met Francis when he was honored with the Esther Montanez Leadership Award at last year's Mad About Art; this year he served as a Chair of the event. Francis - real estate investor, entrepreneur, literary agent, and art enthusiast - is a man on a mission: Via the Greenburger Center for Social and Criminal Justice, he is leading an effort to reform the criminal justice system, with an emphasis on fostering more enlightened treatment of people in the system who have mental illness. Francis believes that "creativity is a core value that transcends cultural and cognitive challenges and unites humanity in a common impulse of expression." It's no wonder that he's a booster of Fountain House Gallery, and of Fountain House's groundbreaking programs in areas such as employment, education, and wellness. 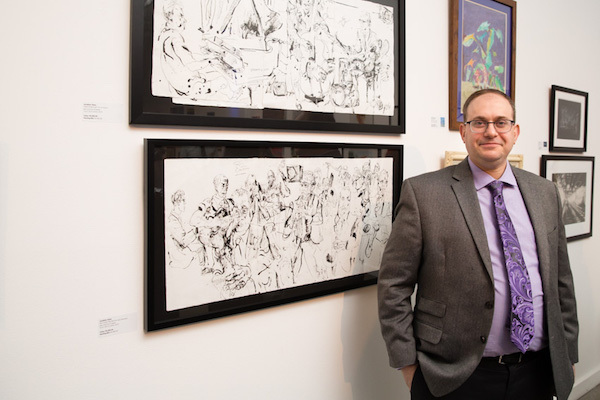 Gallery artist Jonathan Glass with his "jazz drawings." Jon shared his personal story with the assembled guests. This year's recipients of the Esther Montanez Leadership Award were Lawrence Benenson and Phong Bui. 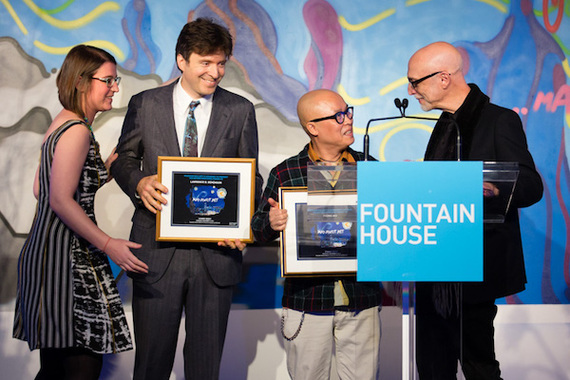 The Award, established in memory of Fountain House Gallery's founding director, honors individuals for outstanding support of the Gallery and its artists - and these two honorees have delivered mightily on that score. Their most recent service: Lawrence and Phong, gentlemen of art and goodwill, curated the Mad About Art auction exhibition. The Award was presented by Frank Maresca of the prestigious Ricco/Maresca Gallery. Frank is a past Fountain House Gallery honoree and an invaluable member of its Art Advisory Board. Honoree Lawrence Benenson has a charmingly witty presence and regaled the audience with quips and aphorisms. With great sincerity, he lauded Fountain House as "a shining example of grassroots community building." I was fortunate to view Lawrence's prodigious personal art collection last fall, and the impact of the myriad works was profoundly amplified by his informed and droll commentary. 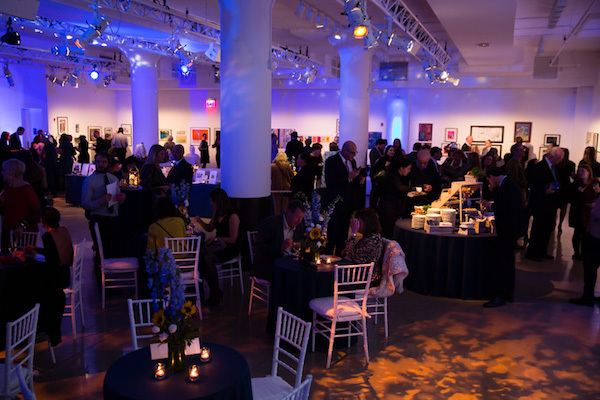 Lawrence, a Partner of Benenson Capital Partners, serves on the Boards of the Museum of Modern Art (MoMA) and the American Folk Art Museum, and contributes to the community through participation in a host of other organizations. His motto: "People who have more should help people who have less." Amen. "New York Starry Night," inspired by the Van Gogh original. Honoree Phong Bui spoke of his journey to a greater understanding of the intersection between art and mental health, and of the importance of taking action on this realization. "Action" could be the middle name of the irrepressible Phong, an artist, writer, and independent curator who serves on the Fountain House Gallery Art Advisory Council. He is Publisher and Editor-in-Chief of the cutting-edge monthly The Brooklyn Rail, which offers critical perspectives on the arts, politics, and culture. Phong elicited hearty laughter from the crowd as he closed his remarks with a memorable one-liner: "An artist who has not had a nervous breakdown cannot be trusted!" The author with Honorees Phong Bui and Lawrence Benenson. 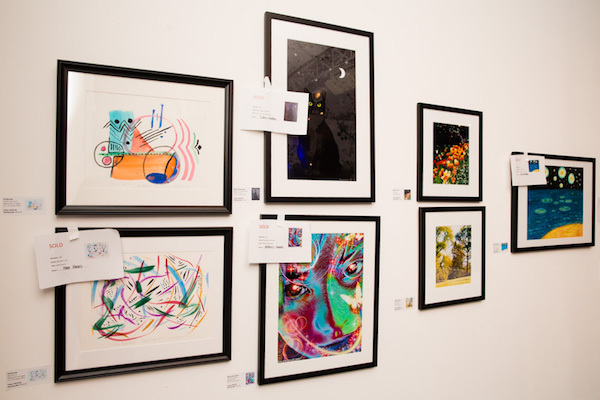 This year's magical Mad About Art is now in the rearview mirror, but there's no need to wait until next year's event to get a fix of Fountain House Gallery art. The Gallery hosts six exhibitions per year at 702 Ninth Avenue, its home base since 2000. There's still time to head over to a Gallery show that has become an annual favorite with collectors and holiday shoppers: "Small Works: $100 & Under," on view through December 22. Go. See. Enjoy.